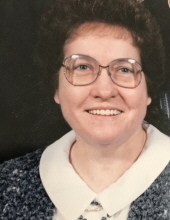 Shirley Joan Newton, age 79, of Huntingburg, passed away at 12:26 p.m., Thursday, April 4, 2019, at her residence. She was born January 22, 1940, in Huntingburg, to Bert and Bessie (Brice) Wilkey; and married Carl “Ray” Newton on December 4, 1970, in Huntingburg. Shirley was a member of the First Pentecostal Church in Birdseye, where she served as the pianist and a member of the worship team for the past 45 years. She was dedicated to the service of God and enjoyed singing and playing music, both personally and during church services and functions. Prior to becoming a wife and mother, she travelled with various evangelistic ministry and singing groups delivering the message in music and song. Shirley was a devoted mother and friend to many and was an enthusiastically vocal “living room recliner cheerleader” for the Indiana University Basketball team. She was preceded in death by her husband of 47 years, Carl “Ray” Newton; her parents; six sisters, Helen Jane Wilkey, Mildred Grace Blume, Nellie Wilkey, Alberta Marie Wilkey, Dora May “Doddie” Leonard and Dorothy Jean Huff; and five brothers, Arthur Wilkey, Elmer James Wilkey, Edward Sherman Wilkey, Walter Reed Wilkey and Herbert Hoover Wilkey. She is survived by her son, David Ray Newton of Huntingburg, formerly of Evansville; David’s girlfriend and Shirley’s caregiver, Jill Wethington of Huntingburg, formerly of Evansville; one God-son and God-daughter, Eric Harper and Paula Harper of Jeffersonville; one sister-in-law, Janet Thurston of French Lick; one brother-in-law, George Newton; and a host of nieces and nephews, friends, neighbors and Brothers and Sisters in the Body of Christ, especially the Birdseye Pentecostal Church family. "Email Address" would like to share the life celebration of Shirley J. Newton. Click on the "link" to go to share a favorite memory or leave a condolence message for the family.